While I’ll eat any type of pizza you put in front of me, I’m partial to thin crust – the crispier, the better. I’ve made many different pizza dough recipes in the past, but this one? Is truly amazing. My absolute favorite + THE BEST I’ve tried. Really! It’s so easy to prepare, requires ZERO rising time, + takes less than 10 minutes to bake from start to finish. The result? A light, crisp, flavorful pizza crust that provides the perfect base for whatever toppings fit your fancy. Note: This recipe makes enough dough for TWO 12″ pizza crusts. Each pizza serves roughly 2 adults as an appetizer, or 1 person as an entree, so if you only need to feed one person, you have two options. 1) Halve the recipe. Easy peasy! Or my preferred option: 2) Use one pizza crust for dinner, put the rest of the dough in a ziploc in the fridge, then use it within the next few days for lunch. I used my first crust to make a pepperoni pizza for dinner, then I used the rest the next day to make a tomato, basil, asiago + mozzarella pizza for my lunch. (For lots more food pictures, you can follow me on instagram.) YUM! optional: 1/2 tsp italian seasoning (or any dried herbs of your choice) – i like to work herbs into the dough, but it’s wonderful without the herbs, too – your choice! About 30 minutes to 1 hour before baking, preheat the oven to 500 degrees F. If you have a baking stone, put it on a rack in the lower-middle part of the oven before preheating. In a small bowl or liquid measuring cup, heat the water until it feels barely lukewarm when you test it with your finger (if the water is so hot that you can’t leave your finger in it, wait for it to cool down). Add the yeast to the water + use a fork or whisk to stir it into the water. Set this aside for a few minutes + allow the yeast to dissolve. It’s okay if the yeast doesn’t bubble, but it should be entirely dissolved. Measure out the flour into a large mixing bowl. Add the salt + dried italian seasoning/herbs (if using) + use your hand or a whisk to combine. Make a well in the center of the flour + pour in the water-yeast mixture. Use your fingers or a wooden spoon to combine everything together. Knead the dough until all the flour is incorporated + the dough is smooth/elastic to the touch–about five minutes. The dough should still feel moist + just slightly tacky. If it’s sticking to your hands + counter-top like bubble gum, work in more flour one tablespoon at a time until it’s smooth + silky. Tear off two pieces of parchment paper roughly 12-inches wide. Work one piece of the dough in your hands + form it into a large disk. Lay the disk of dough on the parchment paper. Working from the middle of the dough outwards, use the heel of your hand to gently press the dough outward until it’s about 1/4 of an inch thick or less. You can also use a rolling pin for this part. You can make free-form pies, or if you’d like a circular pie, you can trace a large circle on the back of the parchment to use as a guide. Note: The dough will stick to the parchment paper, making it easier for you to roll out. You’ll bake the pizza right on the parchment paper. As it cooks, the dough will release from the parchment, + you can slide the paper out before serving. Spoon ONLY the sauce into the center of each pizza + use the back of a spoon to spread it out to the edges. Bake for about 5 minutes, then rotate the pizza 180-degrees (most ovens have ‘hot spots’ + your pizza will bake unevenly if it’s not rotated). Bake for another 3 minutes, then sprinkle the cheese + any other toppings over the top. Bake for another 2-3 minutes until the edges are golden brown and crispy. If you like your cheese browned slightly, broil for a minute or so. Remove your pizza from oven + let it cool on a wire rack. At this point, you can slide the parchment paper out from under the pizza. Repeat with second pizza. Let both pizzas cool for about five minutes + serve. This is the first recipe I tried out in my new oven and it was awesome! I absolutely loved it and so did the 12 people who were over for dinner!! I felt the base was sticking to the paper – so I actually greased the base with a little olive oil! THank you so much for sharing! This one is a keeper!! 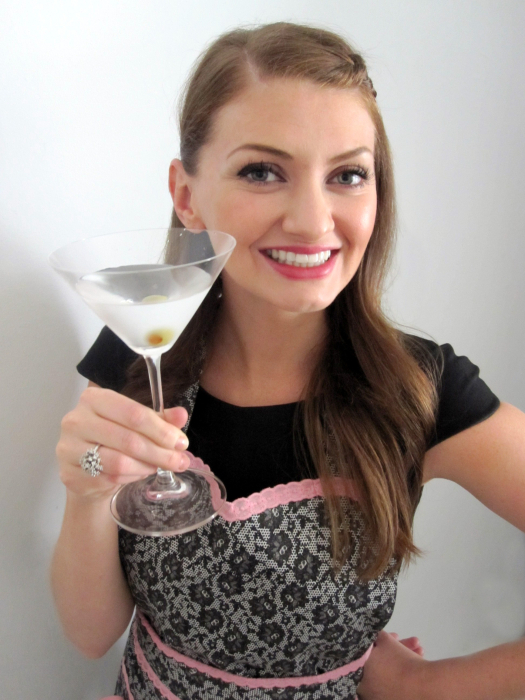 I am SO thrilled that this was the first recipe you tried in your new oven – how awesome! And thanks for the tip about the olive oil. I haven’t had any problems with the crust sticking after it cooks, but I do know that a lot of my readers add olive oil to the crust, because they love the flavor that way. Good to know it helps with sticking, too, if needed! I don’t do much cooking, as the Lovely Wife usually does it. But I am a HUGE pizza fan, so thought I would give this a go, instead of the premade stuff. Did it all myself, and it turned out great! Nice and thin, and nice crispy edges, perfect! Thanks! I have made this recipe a few times, works wonders, however, I’m unable to get the slightly. Crispy but flakey texture on the crust like Italian thin crusts which are actually the result of bubbling in the dough and rising. Any idea how to achieve that? Just halved this to make my daughter cheesy bread. It didn’t seem to brown up like regular pizza dough. Is this supposed to rise before you bake it? We didn’t use sauce, only olive oil, a bit of butter and lots of cheese. Maybe I missed something. Hi Tara, This is a no-rise crust, so you didn’t miss a rising step. =) The no-rise is what gives it that thin, crispy, crackery crust. Is that the texture you were looking for? Or did you want more of a traditional doughy pizza crust for your daughter’s cheesy bread? Since this is a really thin, crackery crust, it really does best with a fairly light coverage of toppings. My guess is that, if you used a ton of cheese, it was so much that it didn’t allow the crust to brown up / cook up like it normally would. Did you bake the crust first with just the olive oil/butter? And then add the cheese later? I know this is probably a stupid question but I am kind of new to the whole pizza crust making and I wanted to know how I would use instant yeast because the package tells me to just add it to the dry ingredients? That’s not a stupid question at all! It seems like most people don’t quite understand the difference between different types of yeast. Myself included, until I googled it a couple years ago. I always use “active dry yeast” in this recipe (and almost all yeast recipes) — with that type of yeast, you always need to dissolve it in water (or another liquid) first. With “instant (active dry) yeast,” you do not need to dissolve it in water. It’s milled into smaller, finer particles, which is why you don’t need to dissolve it. But, they’re interchangeable otherwise, and the amounts you use for each are the same. So, for this recipe, you can use the same amounts – you just don’t need to dissolve the yeast in the water in the first step. You can add it directly to the flour/herbs, and then just add the water to that mixture. Does that make sense? Does that help? Hi! I read the instructions and everything, and this pizza sounds delicious. But I’m only planning on making one pizza crust; should I divide the measurements by two? I wasn’t too sure, and I didn’t want to go ahead and start baking and end up wasting any ingredients, so I was just wondering what you suggest. Thanks! Yes, Claire – that’s exactly right. Whenever I just want to make one crust, I simply divide everything by two. =) Enjoy! Hi Betsy! This is a no-rise recipe, meaning it has no waiting/rising time. The yeast *does* activate while it’s baking, so it has a very-slight rise while it’s cooking. If you’re doubtful, give it a try! As you can see, the previous commenters who have made this have been overwhelmingly positive about it! 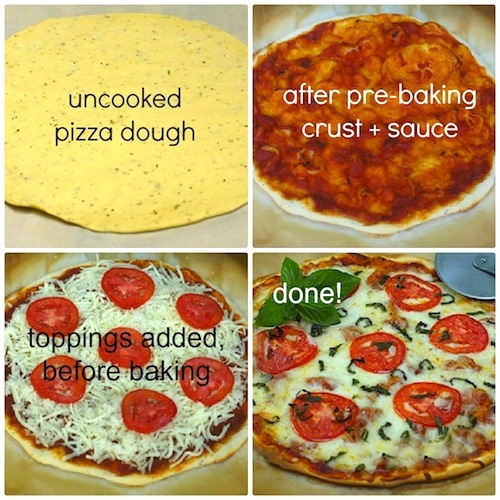 I have searched for years to find a pizza dough recipe but have always been left disappointed. This is such an awesome recipe thanks for sharing. I am SO thrilled to hear that, Daryl! So glad you enjoyed it! What kind of pizza stone do you use? I have a Pampered Chef and am afraid to preheat it along with the oven. See below. Q: Should I preheat my oven before baking with Stoneware? A: Yes. However do not preheat empty Stoneware in the oven, because this may cause the Stoneware to crack or break. Hi Bonnie! I believe mine is an Emile Henry pizza stone (I’m not home now to check the brand). Here are the instructions that I’ve always followed re: pizza stones — “Place your room temperature pizza stone into the oven before you turn it on. Set the oven to the desired temperature and allow the oven and the pizza stone to heat up together. This creates an evenly heated pizza stone that is ready to bake pizza efficiently.” I will say, I googled different pizza stone brand instructions, and there are a TON of blog posts/articles dedicated to confusing/contradictory pizza stone instructions (like this). Meaning, one brand says NOT to preheat it in the oven, one brand says ALWAYS to. Personally, I’ve always followed the instructions I quoted above, and I’ve never had my pizza stone crack. And I was always told that putting a cold pizza stone into a hot oven is risky because it can cause cracking. Anywho, I’d never want you to go against manufacturer’s instructions on your particular pizza stone, but it may be worth a call to Pampered Chef’s customer service line to get them to clarify. If the don’t want you to preheat it “empty,” are you supposed to cover it with something? I’m admittedly confused. You could also ask if putting the cold pizza stone in the very-hot oven is risky (as it may cause cracking), like I’ve always heard. I’d be curious to hear what they say! I have never left a comment on any website, but I felt compelled to tonight. I have made homemade pizza 100+ times and have never enjoyed the texture of any of them. This is the best homemade crust I have ever made/tried. It is wonderful. Thank you! Hi Amber! I feel so happy that it was this recipe that inspired you to leave your first comment, and I’m even happier that you loved it. Hope you enjoy making it for years to come! Thanks for the recipe!! It works really well for making calzones as well. Your thin crust piiza dough recipe is a smasher!! Baked two pizzas yesterday and they turned out delicious! Awesome, Bernhard! I’m thrilled to hear it. Do you have nutritional value for the crust and pizza ingredients as written by you? Megan, I do not typically calculate the nutritional value for my recipes, sorry. There are lots of nutritional value calculators online if you want to calculate it! It is impossible in conclusion whether statin treatment created these sexual side effects, or if they are because of another thing. Love this pizza dough recipe Very easy to make. My question to you is whether this dough freezes well. Thank you. Hi Marie. Yes, the dough freezes very well! I’ve found that the flavor gets a bit deeper after freezing, and the texture is slightly different — a bit chewier (in a good way), in addition to being crisp. A bunch of my readers have also commented that they’ve had success freezing it (and no one’s had a complaint after freezing it), so that’s a good sign. =) Enjoy! Hi, looking for a thin crust so I’m gonna give this one a go. But I’m wondering, why do you need the yeast if it’s not going to rise? I have a wood fired oven . Do I still have to do a double bake or can I put it in in one go ? Hi Mike, I confess that I haven’t baked personally with a wood fired oven. If you’re cooking at a super high temp (like 650-750 F), I’d think you wouldn’t need the double-bake, as long as your toppings aren’y layered on super thick. Do report back how it goes if/when you try it! 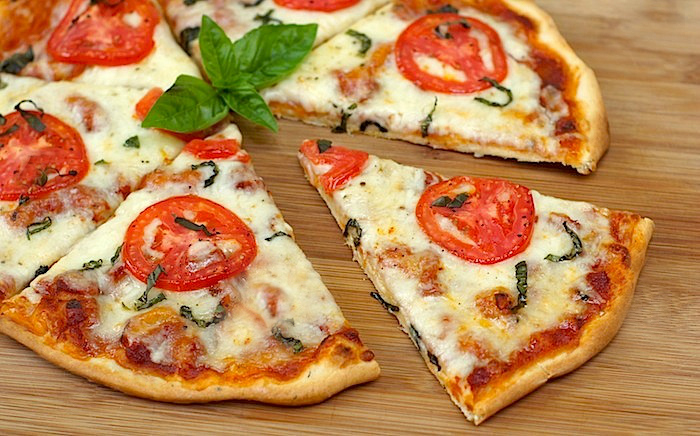 This is my go to recipe for crispy thin base pizza. I have been making it under the grill/ broiler (top element) in the oven. Put oven rack in centre of oven. I heat oven up while I grease a foil lined sheet pan with oil. Spread little oil on half the dough & roll out as thin as possible. I put pizza base in oven to lightly brown on the top side and then using a towel, flip the dough onto the other side & cook other. just takes about +-2 minutes per side. I remove from oven & repeat with 2nd half of dough. spread my homemade pizza sauce, grated gouda cheese, chicken mince or shredded /cubed chicken then mushrooms & more cheese. & place back under grill to melt cheese. This pizza dough is so delicious & crunchy. we love it. thank you for an amazing recipe. fry onions & peppers in a little oil till onions are soft. Add spices & salt & tomatoes & a little water & mix. Add dried mixed herbs & dried oreganum. Cook till tomatoes are soft & sauce is thick. Taste to see if salt is right & if too tart add more sugar. Allow sauce to cool for a bit. I’ve listened to regarding All those pop-ups cinemas inside LA. Still, they use’t shift specifically “upon supreme” of the graves This is truly creepy! Inside of a favourable course! my problem is I like a lot of stuff on my pizza – tomato sauce, cheese, mushrooms, onions, green peppers , sausage and pepperoni . Very recipe or claim for thin crust turns soggy. When growing up, way too many years ago, in Milwaukee, all pizzas were firm enough to hold all those ingredients. Now everything needs to be folded. Will your double baked crust hold up? Hey Mike! Honestly, I don’t know. This crust is more crackery than the typical crust, SO, it *may* hold up to your love of toppings since it has a little holding power. I’d love to hear how it turns out if you try! Also, I use America’s Test Kitchen recipe. They use an oiled (2 tbsp.) 12″cast iron skillet. Place your prepared pizza into skillet over medium high heat on stovetop until bottom is lightly browned when lifted with a spatula – 3-5 minutes. Finish off in 500 degree oven 8 min. Can’t wait to try your dough recipe. Hi Maggie! I have not tried this with wheat flour, and I honestly bake very infrequently with wheat flour, so I can’t help you with that one. I hope you’ll experiment and report back, though! =) The ATK recipe sounds excellent!